The Griffith Narrabundah Community Association [GNCA] is a not for profit, voluntary community based organisation operating in the Griffith Narrabundah area in the south of Canberra. The objects and purposes of the Association are “to protect the amenity and interests of the Griffith and Narrabundah communities, particularly in relation to the preservation of community facilities and open space”. The Constitution of the GNCA can be read here. Our Facebook page can be found at https://www.facebook.com/TheGNCA. Click to read our GNCA social media policy. The Committee usually meets on the second Wednesday of the month at 7:30pm at the East Hotel, 69 Canberra Avenue, to discuss news, issues, current and future projects plus feedback from Members. Members of the public are welcome to attend. The dates for our 2019 meetings are 13 February, 13 March, 10 April, 8 May, 12 June, 10 July, 14 August, 11 September, 9 October, 13 November and 11 December. The AGM will be held on 23 October at The East Hotel, 69 Canberra Avenue (corner of Giles Street and Canberra Avenue), Griffith. Annual Membership is $10.00 per person and is your opportunity to provide valuable input and participate. The rules and constitution of the Association are here. The GNCA Inc Newsletter is published regularly with news and coverage of immediate issues of concern to the Community such as Development Applications and any changes of use proposed for urban open spaces and public facilities. The GNCA is a member of the Inner South Canberra Community Council (ISCCC), an umbrella organisation representing the community and residents’ groups in the Inner South. The ISCCC frequently organises forums to consider issues of relevance to residents of the Inner South, and we will publicise these on this page. The ISCCC’s website is www.isccc.org.au, and its email address is info@isccc.org.au A map, which shows which Resident Group covers your area, can be found below on this page or by clicking here. Since 2000 the GNCA has been involved with many issues of concern to Griffith and Narrabundah residents. Click here to see some of the Current Issues. 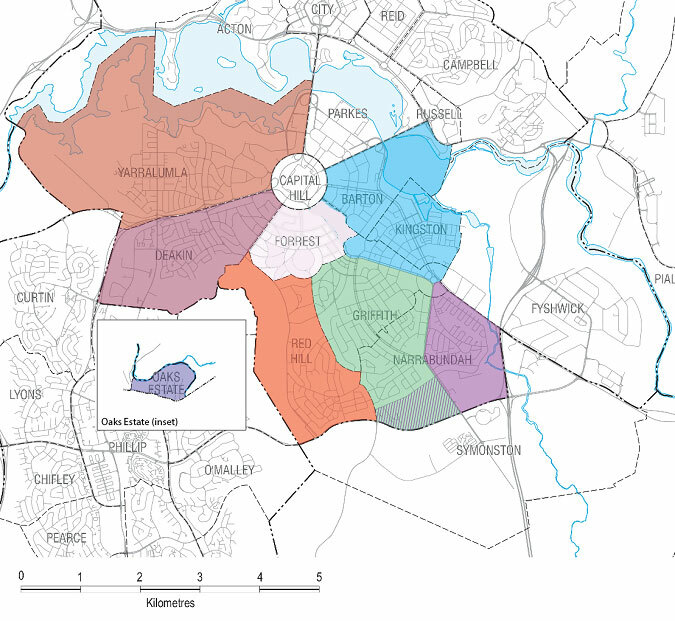 We live in one of the Garden City suburbs which is part of Canberra history. Read more in the Griffith Neighbourhood Plan (634 KB PDF) and about the Garden City (784 KB PDF). It is a special area to be nurtured. Sound planning principles demand that our existing urban open space areas remain protected and community facilities are appropriately maintained. The loss of open space land and community facilities available to the public cannot be justified, especially given that these are already quite limited in the Griffith/Narrabundah/Kingston area. In recent years there has been a lot of urban in-fill and the population has increased considerably.